? 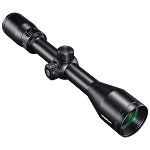 Advanced Dual Optic (ADO) 3X-9X variable magnification scope with a 42mm objective lens. 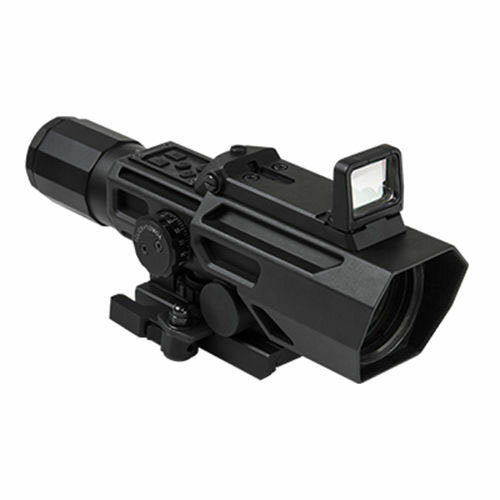 The ADO Scope features an integrated Red Dot Reflex Optic on top of the scope body.
? 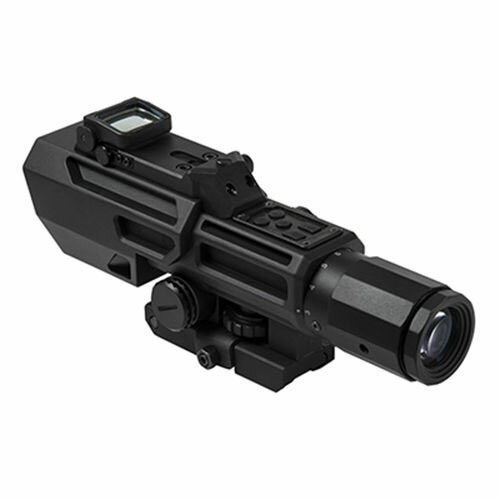 The Red Dot Reflex lens folds down when not in use and with a push of a button the Reflex Lens flips up to the deployed position and automatically turns the Red Dot reticle On. When the Reflex Lens is folded down to the stored position, the Red Dot automatically turns Off.
? The Electronic Control Panel is placed on top of the scope for Ambidextrous use. You can turn On/Off the Illuminated Reticle, adjust the brightness level of the Illuminated Reticle, change select the Reticle Color from Blue or Red, and adjust the Red Dot brightness level. There are five brightness settings for the Illuminated Reticle and the Red Dot.
? Elevation adjustment is done with the accessible turret wheel on the bottom of the scope and the Windage adjustment is via the Target Turret on the side.
? The ADO whole Ocular body functions as a large Magnification ring. There is also an adjustable reticle focus ring at the end of the ocular lens.
? 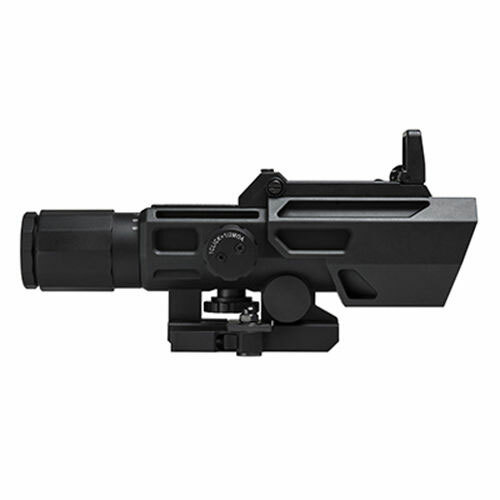 New GEN3 Integrated Auto Locking Quick Release Mount, fits Weaver/ Picatinny/ MIL-STD 1913 type rails. 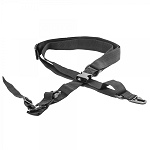 Features a redesigned and more compact lever.
? Uses 1 CR123A Lithium Type Battery (Included) for a long battery life.
? Fully Multi-Coated lens for a bright crystal clear image quality.